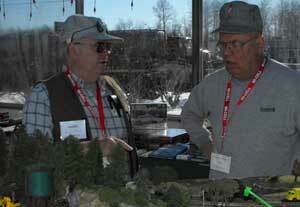 Bill Payne of our Nottawasaga Model Railway Club brought this Illinois Central HO caboose (van) to the 2009 Barrie Train Show where our modular layout was displayed. This technique could be used to light the interior of any rolling stock, at least in HO and larger scales. 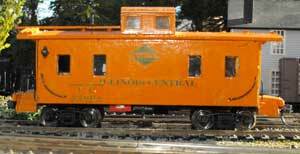 Bill's novel approach was to make the side panel of the caboose easily removable without the use of a hinge.His method was to glue small magnets to the back of the side panel and to the interior ends of the car. This makes it easy to open the car to replace the 1.2 volt battery that lights the marker lamps. You can see on the bottom of the car that Bill sawed apart a dip switch and glued it next to the brake cylinder so he can turn the power on and off without opening the car. It looks like a red tool box. This shows the side of the caboose with the side back in place and secured by the magnets. The power switch is hardly noticeable at the bottom of the side. It is glued to the floor of the car. This approach to lighting the marker lamps is applicable to any freight or passenger car where you want to be able to turn interior lighting on and off. Instead of the side panel you could use the same technique with a roof. 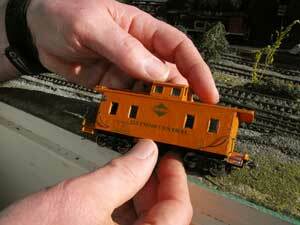 It could also be used with any building on your layout. 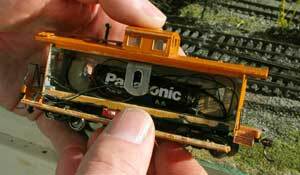 By the way, if you study the snowplow photos on the Barrie Train Show page, you won't see a power switch. Brad's CN snowplow uses the brake wheel to activate the power. Magnets have lots of uses around the layout. Besides Bill's trick, use them for uncoupling cars, holding building flats to a backdrop or securing buildings in place without gluing them as permanent installations. Go from "marker-lamps" to Rolling Stock Tips. Return from "marker-lamps" to my Home Page.